Over the past days, I have started to write this…and each time have found the words evading me…..
On Weds. June 16,2010 at 2:47pm I received a Text message from my youngest brother who is an EMT saying that someone we know was badly injured in a Car wreck. being Human, a part of me immediately started to worry as my mind raced as to who it could be, but also began to pray. I prayed for whoever it might be, and I began to pray for my brother. As I prayed, my sister called me and told me who ….David Camp, the Youngest son of the Pastors of my family’s church in Upstate NY, and a close friend of our Brother’s. It is no coincidence to me that BOTH of the young men I was praying for that Day are named David…One was fighting for His life…and one fighting to save His life. As I Prayed, the story of David and Goliath came to mind. As things unfolded, I found myself struggling once again with being so far away from my family. The Dr’s were not very positive about David’s condition, and the prognosis was grim. My brother Dave started a group on facebook to pray for David, and I am quite certain that what happened was more than any of us ever expected. the number of people from all over the world praying for David and his family quickly climbed into the thousands. I found myself in the midst of a prayer chain that was stronger and more powerful than anything I had ever felt in my life. We prayed, and David made it through the night weds night….the Dr’s had said he wouldn’t. We continued to press in and pray, standing united in prayer, friends and family and strangers alike, and David’s Vitals began to improve. As the deadline for when the Dr’s were going to turn off life support closed in, the prayers grew stronger…as did the number of people praying. It spread like wildfire. As time marched on, I felt the overwhelming need to worship…and I poured my heart out in songs of praise to God, as I did, I shared the songs that spoke specifically to me for the battle we found ourselves in the midst of. A part of me wondered if, me being so far away…was what I was doing helping. Saturday night at about Midnight, my mom called me from NY…..asking me to pray, the Hospital had kicked out all but immediate family…..those covering the Family in comfort and worship all had to home. I stayed up till almost 3 am….talking to my mom online, praying and worshiping the Lord. a few of my mom’s friends were also up with us, and it was a beautiful time of worship….even though we were all in our own homes…connected only by the internet in the physical…there was a deeper, stronger connection, words can’t describe it, but I truly felt as though we were all in the same room, God met me that night…The power of His presence was overwhelming, and did not leave me as I went to bed. It stayed with me all day Sunday, and grew so strong, all I could do was praise Him. Sunday night at 9pm EST, David’s heart stopped…..the number of people praying around the world had surpassed the 5,000 mark….even as David was going home to be with our Lord, we pressed in, united, believing for a Miracle. We held up the Family, praying for Peace, coming against a spirit of fear, and held the line. at 2 am, the Family released David into God’s loving arms, and while my heart sank, and my flesh cried out “Why God, didnt you hear our cries?” a still small voice said to me ” David IS fully Healed, and look around you…I am here with you, as I am in China, and Rwanda, and Tanzania, and Kuwait, and NY and all over the world…even as you all came together in prayer for David, and His family. Most of you have never met, because you love me, I am with you and I will not leave you.” My heart was shattered, and I wept with my friends for the loss of their son, brother, Uncle, boyfriend, and friend, my friend…yet my spirit rejoiced as I saw David , with His heart of worship, dancing. Monday brought many tears, and as I cried out to God in song, I found comfort. 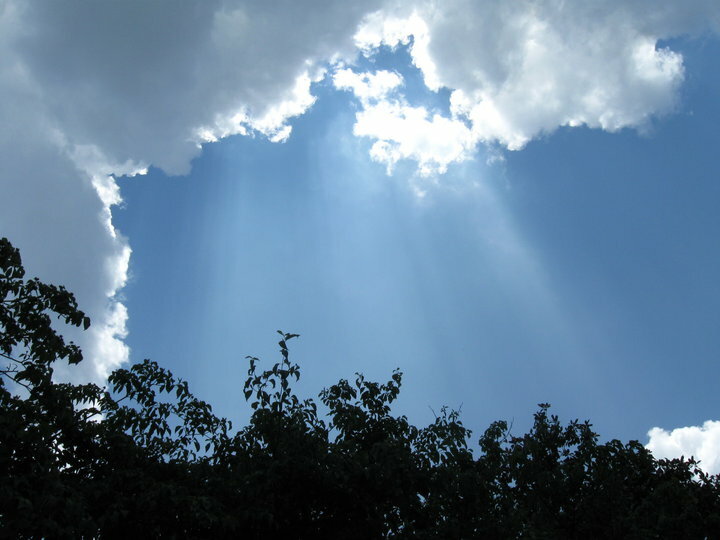 as I was working in the yard, and crying, singing worship songs, I looked up , and what I saw comforted me in a way that words can’t describe….. I continue to lift the Camp family, and David’s girlfriend up to the Lord, may God surround them in His arms and comfort them trough this. I am still trying to come to an understanding of what happened…and while I don’t understand…I have come to the peace that God is in control…and to go back through and read the continued support on Facebo0k for David’s Family and friends from some 7,000+ people, family and strangers alike….the one song that comes to mind is…..
sing of you among the peoples. 11Be exalted, O God, above the heavens; let your glory be over all the earth. Posted on June 23, 2010 by RachelB	• This entry was posted in Faith, Family, Prayer and tagged Faith, Family, Love, Prayer. Bookmark the permalink. I agree Cali. My brother, Aaron , shared your blog with me, and it blessed me. what happened as we all joined together, and continue to stand, holding the line….there just are no words for. David will be deeply missed, and ys, at the same time we can rest in the assurance that we will see him again one day. For any of you reading this…Cali’s account of David’s struggle is heartfelt and moving…I encourage you to go to her blog and read it. God bless you all! Click Here to get to her blog!